Boston is a very big city found in Massachusetts. With its metropolitan area considered the eleventh largest in the US, Beantown is massive so you’ll want to make sure to map out what you’d like to see before you get there. It is home to a number of museums and cultural spots that visitors can enjoy while in town. There are lots of activities that you and your family can indulge in as well. Here are some of our favorite popular and fun activities that you can take part in and some great spots you can check out. From the moment you arrive at Boston Logan Airport you can feel the history in the air. Boston is home to some of America’s most recognizable historic sites and treasures. Getting your airport ride booked prior to your trip can make your vacation in Beantown go much more smoothly. GO Boston Shuttle offers everything from private sedan service to airport shuttles. You’ll find their prices are fair and there service is friendly. Black lane offers private, business class service. This is a perfect choice if you traveling on business going to the Boston Convention and Exhibition Center. When flying into Boston International Airport, also known as Logan International Airport, travelers can find many things to do. If you are a parent then you can take your kids to Kidport which is a designated area for playtime, televisions to help pass the time and restroom areas. There are also dozens of shops, places to eat as well as rest areas located throughout the airport for passengers to help pass the time. Boston is one of the oldest and biggest cities in the United States. It is famous all over the globe not only as an economic hub but as a pioneer in the field of education, sports, and other activities as well. MIT is regarded as the finest university when it comes to science and technology. The institute welcomes students from all over the world. BOS Airport is one of the many well-built airports in the US. Due to a huge size and high numbers of companies offering their services, it serves the main Boston City as well as its nearby areas. It has a total of 6 runways and 4 terminals and thousands of employees serving the passengers. The airport is huge and the crowd here is always high, but you will seldom find any hassling here. Having an access to the airport is quite easy. Despite the huge size of the airport, every corner of it very well-maintained. It is a beautiful structure with clean facilities, and a lot of options to spend your time; you can have a snack, drink coffee, and enjoy drinks at the bars inside the airport. Free Wi-Fi keeps you connected to the internet and power charging stations don’t let your smartphones run out of battery. You will find a rail service connecting the airport to the main city. So, you can reach the airport from city within minutes and that too at very affordable rates. Go on a brisk walking trail through the bustling city of Boston. Founded in 1630, there are almost too many landmarks to visit in the historic city, so make traveling easy by booking a shared ride van from a great company that offers discount prices for every passenger. Whether you want to be picked up from Logan International Airport or want to be dropped off at nearby hotels like the Hilton at Boston Logan Airport or the Embassy Suites, consider your stress relieved. 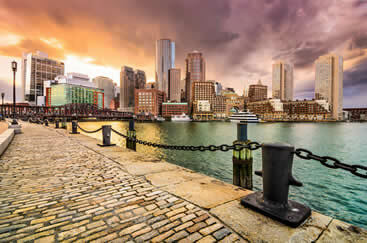 Boston offers a variety of fun things to do for bigger groups, including fun Red Sox games at Fenway Park, where you can get a look at one of the oldest baseball diamonds in the world, and the Museum of Fine Arts, which is host to impression art ands a bountiful collection of Egyptian artifacts. Check out these stunning locations and more by contacting transportation providers for private vans. Also there are many shuttle ride providers that can help out, offering a variety of comfortable and practical solutions for getting around town. Get around town in unmatched comfort by getting a private sedan and see everything Boston has to offer by having fast and reliable transportation. See the tranquil downtown park, Public Garden for a fun 19th century look into landscaping and art. If you want to see other free and historic locations, visit Boston Harbor for beautiful Oceanside views and a lighthouse to die for. Families that need to get around shouldn’t be ignored, and with the help of great transportation names you can get around town, no matter how the group’s size by getting a private SUV, which hosts 5-6. Mistral is one of the most visited posh restaurants in the city, offering sophisticated French dishes in a fun Mediterranean style. Get there in class and elegance by getting a stretched limousine, a trustworthy brand in luxury that provides each guest with a great set of wheels and an even better arrival. When you get tired of traveling through Boston’s vibrant nightlife, have your driver take you back to your luxury hotel, whether it be the Battery Wharf at Boston Waterfront or the Revere Hotel, each one as historically beautiful and centrally located as the other. In order for larger groups to see more of the town, they need to make sure they have a larger ride. This calls for renting out chartered buses. Chartered buses are great for taking fun field trips to group-friendly locations, like the expansive John F. Kennedy Presidential Library, which is filled with interesting political history as well as artifacts from the administration. Another place to consider visiting is the Charles River Esplanade, a beautiful park filled with a variety of trails and vegetation. 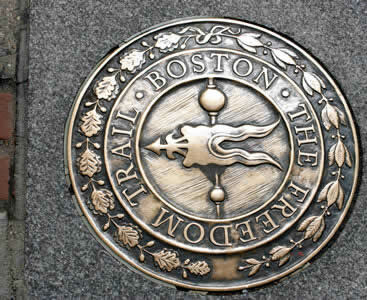 This is a 2.5 mile red brick trail that starts from the Boston Common and takes you through the city ending at Bunker Hill. You can spend your downtime walking along the trail and seeing some of the historical sites this great city has to offer. → If you want the real scoop you can hire a tour guide who will help you visit famous spots in the city that you might otherwise overlook like the Bell in Hand Tavern which is considered to be the oldest bar in the country. → Moving further north along the trail past the bridge you will be able to see Paul Revere’s House and also the Old North Church. → If you aren’t in the mood to walk, let’s face it 2.5 miles is a long trek, but still want to explore the Freedom Trail you can take one of the area’s trolley tours and take a ride along the trail instead. ight in the center of Boston just along the Freedom Trail lies the Faneuil Hall Marketplace. This historic site dates back to 1742. Most of the shops here usually open their doors from 10.00 am to 9.00 pm from Monday to Saturday. On Sunday they are mostly open from 12.00 pm to 6.00 pm. The 75 State Street Garage offers affordable parking if you are driving. → You can do your shopping at the numerous shops here and then later take some time to watch a street performance. 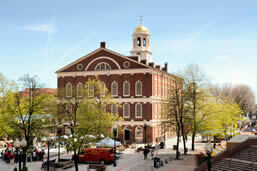 → The Faneuil Hall Marketplace is comprised of the North Market and South Market buildings and Quincy Market. 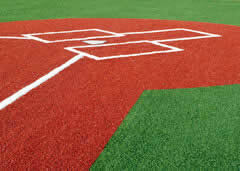 Fenway Park is one of America’s most prestigious and well-known baseball stadiums. Even if there is no baseball game being played on the day you’ll be visiting you don’t want to leave Boston without visiting the stadium to see it for yourself and take in the sights, smells and sounds of “America’s Most Beloved Ballpark”. → The park offers visitors one hour guided walking tours on a daily basis most days of the year. You can purchase tickets and see the world famous “Green Monster” and “Pesky’s Pole” for yourself. → Biking to the park? No problem. Fenway now offers valet parking for bicycle riders who are attending games. Museum enthusiasts rejoice. 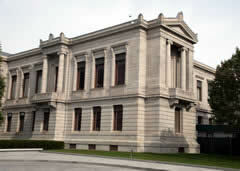 Boston is a cultural beacon with a number of fantastic Museums found here that are ideal for children and adults alike. You can choose to visit any or all of them on your trip. → Some of the city’s museums include the Museum of Fine Arts – Boston, the Museum of Science – Boston, and the New England Aquarium. → If you are visiting Boston with your children you can take them to the Boston Children’s Museum for them to be able to enjoy all kinds of attractions such as an art studio, a huge climbing structure, and a one of a kind stage where they can take part in various types of performances. If you are fashion forward but like to avoid large department stores consider visiting Charles Street where you’ll find numerous independently owned boutique stores and shops. You can spend a leisurely day shopping and you will be able to find everything you may be looking for, and maybe discover treasures you weren’t looking for. 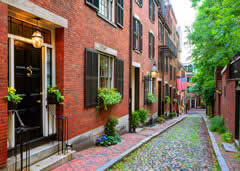 → Charles Street is located in Boston’s trendy Beacon Hill area and also includes the Charles River Esplanade which is a lovely park that you can stroll through. → Charles Street offers seasonal fare such as an ice skating pond in the winter and a carousel and swan boat rides in the summer and spring months. Located in Massachusetts handles millions of travelers who pass through this airport each year can find a reliable and safe airport whether you are arriving or departing. Also known as Logan International Airport passengers can find great hotels located nearby as well as the Port of Boston Massport for those who are in town for a cruise. Book for shared ride vans with popular providers such as GO Boston Shuttle or if you are seeking an all inclusive sedans then Blacklane may be a better choice for you to get professional chauffeured BOS airport transfers.